← Time to zigzag or stay on the straight and narrow? Please gaze upon my bliss. Yes, that’s right. 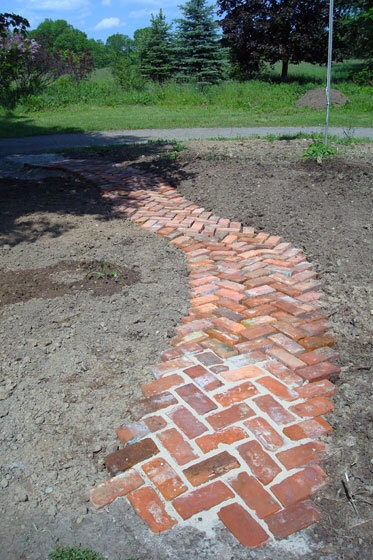 My definition of bliss is a brick pathway. So what? But isn’t it so pretty? 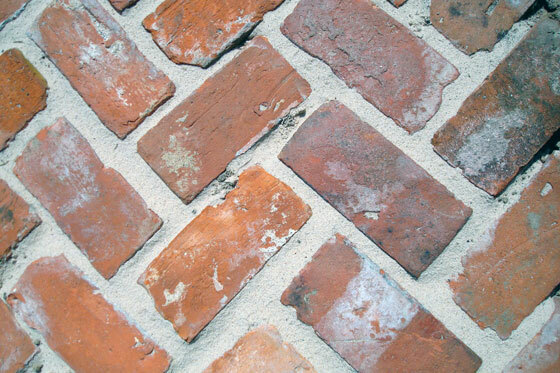 I realize some of you who voted for the traditional brick pattern–or “running bond” as I learned from a commenter–may not agree that this looks lovely. The vote came out very close, which really surprised me: 63% herring bone to 38% brick. I honestly thought herring bone would be the clear favourite. I chose to go with the herring bone after spending a few days looking at the layouts that I’d mocked up last weekend. I just decided that I really, really liked the way it looked. Laying the brick in the herring bone pattern and getting the bricks to bend smoothly around the curve was a bit more challenging than it would have been if I’d chosen another pattern, I’m sure, but I just fudged the spacing between the bricks as I needed to. I still have to fill all of those spaces with sand. I found two bags of something called “magic sand” in one of our junk piles. The description said that it was a polymer infused sand made to fill the joints between paving stones. That sounded like just what I needed so I dumped the bags onto the bricks and managed to fill the joints for the first three feet of pathway. I’ll pick up the rest of the sand this week and hopefully finish off the path next weekend. 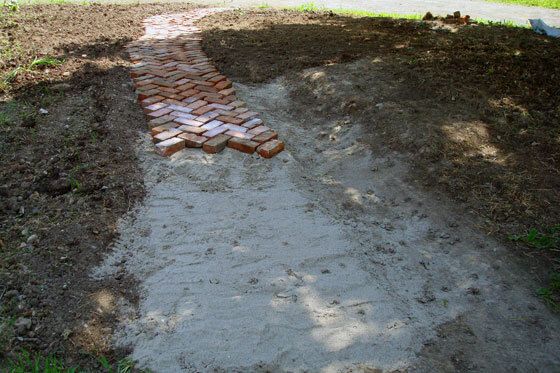 I say hopefully because along with needing more sand, I also need a few more bricks. What might be a little hard to see in the top photo is that as the path heads into the shade, about six feet from the end, I ran out of brick. I knew I was going to be short, and I actually made it much farther across the turnaround than I expected to. Apparently 362 bricks are just not enough. They are enough to make me blissfully happy though. Nice work! Looks great! That polymeric sand is made for projects like that, just beware that it’s about $30-$40 per bag. It’s great stuff though, once it gets a little wet and then cures, it will harden to a rubbery, yet sandy-like substance and lock your bricks in place, but not crack away over the years. Ouch! That’s a little expensive considering the number of bags I’m likely going to have to buy. It sounds like what I need though. Hmmm… going to have to think about this a bit, I think. Wow! I’m so impressed. It looks fantastic. Thanks, Diane! I’ll admit I’m impressed too. Looks really good so far. I too like the herringbone. When you are ready to plant your garden, many of us have perennials that could do with separating like daisies, coneflower, peonies, sedum and on and on. As per the usual Julia way of operating, I bet you have a vision of how this is all going to go. Have a great week. Thanks for the offer, Auntie Anne. I’m realizing just how big of a garden this is going to be and how many plants I’m going to need. I’ll take whatever I can get. I know I voted for running bond, but the herringbone is flat out beautiful. Great choice staying with your artistic vision and great execution. Thanks so much, Lucy! I appreciate your endorsement. It came out beautifully! Imagine how gorgeous it will be when all surrounded by plants and bushes. A little slice of heaven! I’m so thrilled with this project.